A few years ago I introduced readers of The Grape Belt to the wines of Domaine Paul Mas from the Languedoc region in southern France, extolling their impressive combination of quality and low prices. 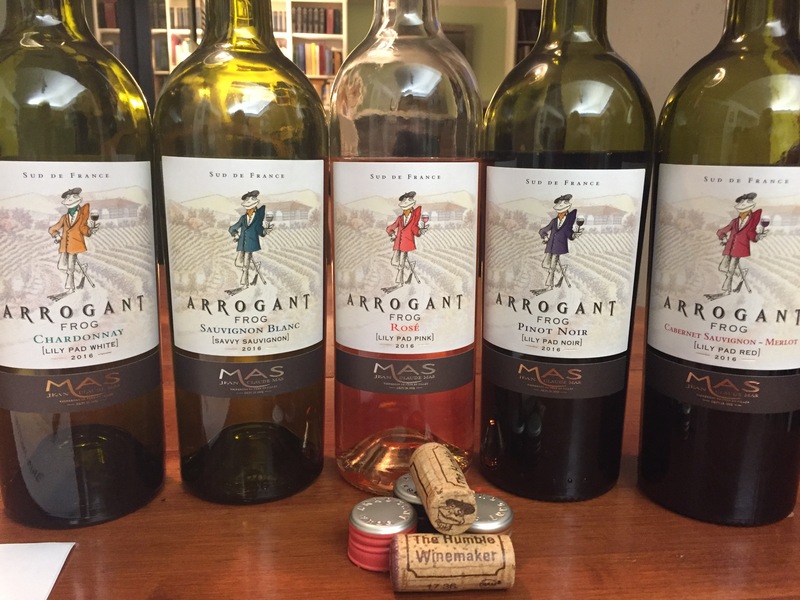 (https://thegrapebelt.com/2016/07/20/head-to-the-south-of-france/) Well, we’re back again with a look at a few more of their wines, this time under the whimsical label, The Arrogant Frog. I will admit that these wines made me hesitate. First, I’m always suspicious of labels with cartoon animals on them, and, second, because Arrogant Frog seemed to tiptoe a bit close to the bigotry out-of-bounds line. Turns out that the owner and winemaker, Jean-Claude Mas, has embraced this durable stereotype other nations have for the French as a way of showcasing the increasingly popular wines he produces. And, any doubts I had stemming from the woozy amphibian staring at me disappeared as soon as I tasted the wine. The reviews below are in order, starting with the wines I liked the most. The two whites tied for first, with the rosé a close second. All five wines are from the Languedoc region, all have a suggested retail price of $9.99. Most of them perform well about this price. 2016 Arrogant Frog Sauvignon Blanc (100% sauvignon blanc, 12.5% abv.) A pale greenish gold in the glass, with aromas of white grapefruit, lemon, and whiffs of green herbs, lemon candy and a hint of flint. Bone-dry on the palate, the wine’s texture in the mouth is a delight. Refreshing, insistent acid, and complex citrus and tropical flavors carry you to a long, lingering finish. This is an excellent value. 2016 Arrogant Frog Chardonnay (85% chardonnay, 15% viognier, 13% abv.) A brilliant but pale lemon yellow, offering tropical fruit aromas, along with notes of white flowers and vanilla. Dry, with mouth-watering acid, well integrated alcohol, and a pleasant, almost creamy texture. Flavors of green apple, Meyer lemon, some peach and vanilla; bits of wet stone on the finish. It’s a juicy wine that keeps you coming back for more. The biggest indicator of this wine’s potential popularity was when a family member, who is averse to most chardonnays, said that this was a wine she would enjoy drinking. Another terrific value. 2016 Arrogant Frog Rosé (100% syrah, 13% abv.) I’ll simply say that I don’t know of a pink wine at this price that offers as much as this rosé. Bright salmon hues draw you to a glass exploding with aromas of flowers, cherry soda, watermelon Jolly Ranchers, with a hint of wet stones. On the palate there is a surprising array of complex flavors, with raspberry and watermelon out in front. Refreshing acid and a pleasing mouth-feel, well integrated alcohol, and impressive concentration round out this bargain of a wine. 2016 Arrogant Frog Cabernet-Merlot (55% cabernet sauvignon, 45% merlot, 13.5% abv.) Pretty to look at with a deep ruby core leading to a garnet rim, but not much to enjoy on the nose, its aromas being somewhat muted. Flavors of black cherry, licorice, and vanilla fill the mouth. The wine is not terribly clumsy but is a bit disjointed. The tannins coat the front of the mouth and stay there. There is a savory, earthy finish that only lasts a moment. This wine would be perfectly acceptable at a large party — agreeable but not looking for any real attention. Nor deserving any. Versatile enough for all sorts of meats and cheeses, as well as a sturdy red sauce dish or well appointed pizza. This wine is a drinker, not a thinker. 2016 Arrogant Frog Pinot Noir (100% pinot noir, 13.5% abv.) I’m a big pinot noir fan so this wine’s poor showing was a disappointment. In its defense, making quality pinot noir, wines with something interesting to offer, at such a low price is damn near impossible. While attractive to the eye, there is a slight chemical note to the nose. And, like the blend above, it comes with a strange, cloying tannic affect, coating the lips and front of the mouth and stopping. There are pleasant fruit flavors in the glass, but the 13.5% abv. sticks out in all the wrong places. Upon a second taste, the wine had quickly devolved into a clumsy mash-up of cloying candy and tart, under-ripe fruit. I can’t recommend this, even as a party crowd pour. Despite this last bottle not showing well — for all I know it could be simply a matter of bottle variation, and another sample might have offered a surprise similar to its companions — don’t condemn the entire line. These are well made wines that offer, mostly, far more complexity and delight than many wines in this price range. Cheers!